Cultured Code appears to have adopted a very different update strategy following the launch of Things 3. Before Things 3, Things received very few updates, often leaving users wondering if Things had been abandoned. Things 3 has been an entirely different ball game, as the app has received numerous point updates to continue bringing the best productivity app for Mac, iPhone, and iPad into the future. Things 3.4 was a massive update for the slightly geekier list of Things users. 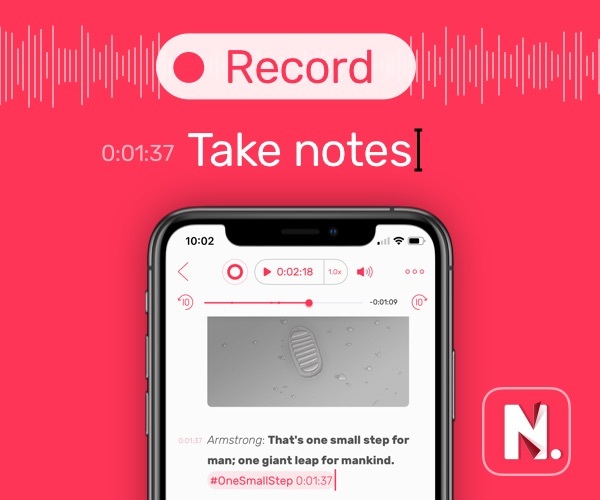 The introduction of a built-in URL scheme allowed for easier inter-app communication between Things and other groundbreaking apps and paved the way for workflows like this and this and this to speed up processes on iOS. I, personally, use the Things URL scheme multiple times every day. Things 3.5 doesn’t introduce the same level of core features, but it shores up a few of Things’ prior shortcomings and improves the overall experience of getting things done. Cultured Code refers to 3.5 as their “Spit and Polish” release — this is a perfect title. Things has the uncanny ability to be to each user what they need — whether you need a simple to-do list that needs to be completed in a work day or you have 50+ projects each with their own step-by-step processes and due dates, Things can meet your needs. In my day job, I create projects for each corporate year end financial statement and tax return I need to complete. Upon completion, I submit the file for review to the partner at the firm and follow up on any changes that are made. Rarely does a corporate file get finished before the next file is started — I usually have between 5 and 10 files on the go at once. Each of these corporate files has its own project inside Things and are kept in my Office area. After a while though, the list of projects in the Office area becomes a little long. And, quite frankly, the list of projects can be daunting, not to mention a chore to scroll through and scan each time I jump from one area to another. Cultured Code has effectively fixed this interruption with collapsable areas. 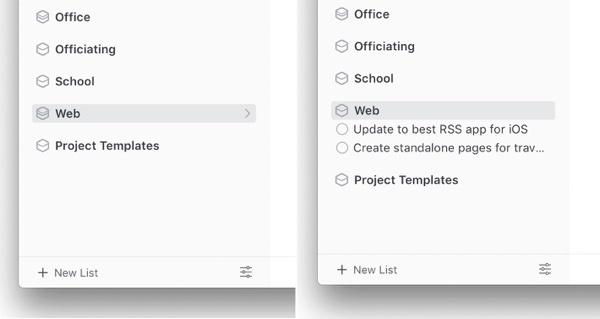 If you have a list of projects inside multiple areas, you can now collapse the projects in that area to scale down the list in the left pane and expand only the area you need to currently focus on. The little cherry on top of the collapsable areas feature is the wonderful little graphic of the area’s box opening up. We love Things’ design ethos here at The Sweet Setup, and this little graphic ranks up there with the filled in pie graphic when you complete a project. One of the features I used most often in OmniFocus 2 before switching over to things was the oddly placed Save+ button. 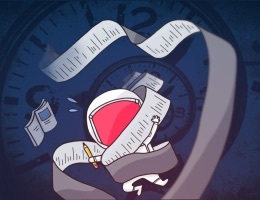 After typing out an item in your inbox, tapping Save+ allowed you to jump right into the creation of your next task, streamlining the brain dump aspect of entering tasks in your inbox. Things 3’s brain dump workflow is hardly efficient — after typing out a task, you have to hit Done on the keyboard before tapping the magic + button to type out a new task. Brain dumping is a chore in Things 3. This hasn’t been perfected inside Things in version 3.5, but creating lists of tasks in other apps and pasting inside Things has been vastly improved. 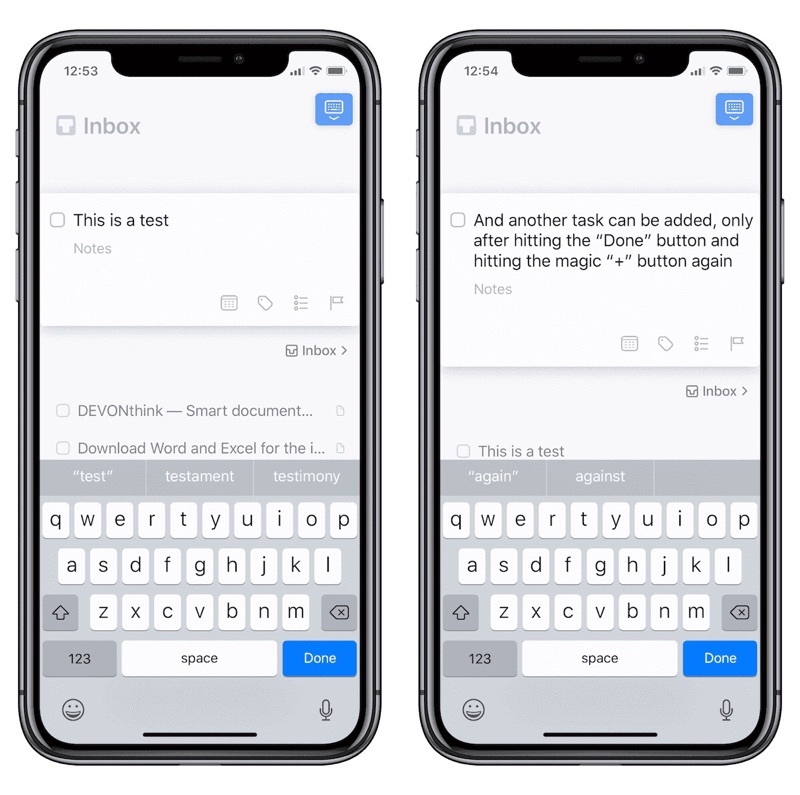 Now, if you were to create a list of tasks in an app like Bear or Drafts, you can copy the list, hit the drop-down menu in the top-right corner of the Inbox on Things for iOS, and hit Paste to have each line create their own task in your Inbox (or just copy and paste on the Mac). In addition, if you’re in the middle of creating a specific task, you can paste multiple lines of text into the task’s title field to add the second and extra lines to the notes of the task. I keep my list of task tags relatively short, but some folks have tags for all sorts of categorization. Things 3.5 introduces a search field in the tag window, making for shorter tagging and organization workflows. Tag searches now present results that include items with tags nested under it. And if you have a specific use for not tagging a task, you can now search by No tag as well. Things’ URL scheme now has a new update command for updating items that already exist — a feature users have been pining for ever since the introduction of the URL scheme. Things’ Today Widget now displays icons for checklists and reminders, moon icons for denoting This Evening tasks, and those lovely pie icons for showing your progress in a project. Things’ overall performance has been improved across the board, specifically for projects with hundreds or thousands of tasks and for repeating tasks. Things’ Settings window has been improved on iOS and the ability to group tasks in the Today view has been added to iOS. You can also customize the Touch Bar on compatible MacBook Pros. The available buttons on the Touch Bar are still a fairly limited set, but you can add a new Trash button for deleting a task. Things now supports Zapier workflows for better communication between Things and apps like Slack, Trello, or Basecamp. Things 3.5’s new feature list isn’t nearly as long as prior point releases, but many of the improvements in 3.5 make working with Things a much more pleasant experience. For instance, I kept Drafts 4 on my iPhone specifically to create brain dump task lists that could be quickly imported into Things. With the addition of new copy and paste magic, I can now create that brain dump list anywhere I please. Collapsable areas have had a stress-reducing impact on my work over the last few weeks — not having to view that pesky list of corporate files awaiting completion has provided an extra little bit of calm. And although I don’t use tags to the extent others do (or to the extent that I should), tag search improvements are sure to be well-received. With every iteration of Things, we at The Sweet Setup are more convinced than ever that this is the best productivity app for most people for the Mac, iPhone, and iPad. The rollout of the highly anticipated OmniFocus 3 beta has provided a glimpse at what Things’ biggest competitor will introduce later this year, and there are sure to be a plethora of OmniFocus features that keep many users firmly in that camp. 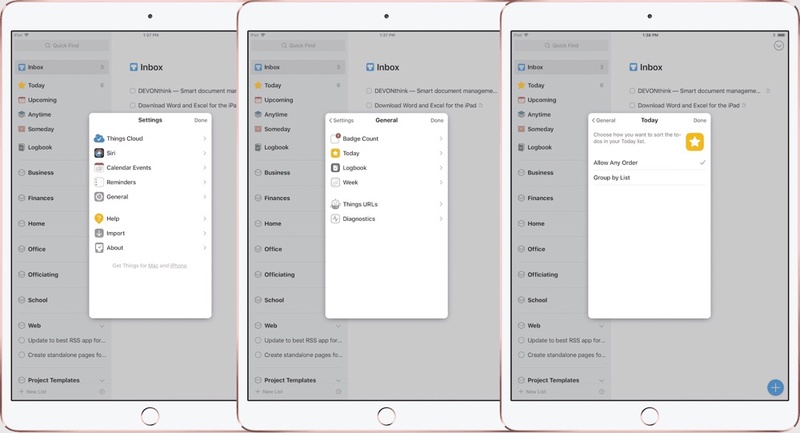 However, the OmniFocus 3 beta serves as a reminder that OmniFocus and Things serve different types of users — OmniFocus 3 is capable of handling simpler needs for users, but it appears to be gunning for power users who need to hash out major productivity needs in new and groundbreaking ways. 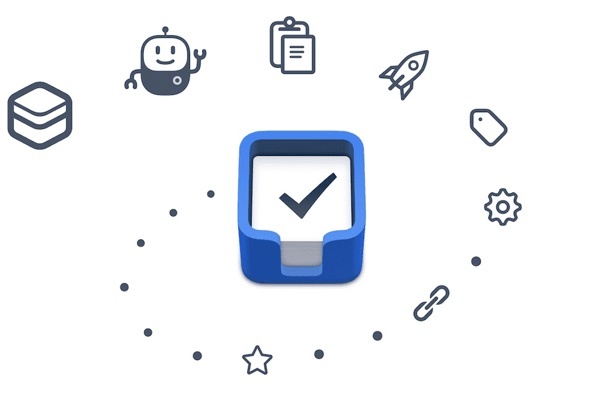 Cultured Code’s recent point updates continue to bring Things more simple, natural features that fit the productivity needs of most people, which is why Things continues to be the best choice for keeping track of all the things you need to get done across all your Apple devices. And, of course, we also have an entire course built to introduce you to all of Things’ features, including a range of tips and tricks for creating productivity workflows that go beyond the digital realm. You can pick up Things 3.5 on the App Store for Mac, iPhone, and iPad.